Memorial City Northwest Corner Aerial Rendering – Rendering Courtesy of MetroNational. HOUSTON – (Realty News Report) – MetroNational has announced plans for extensive mixed-use future development, including office space, retail and a hotel on an 18-acre tract on the north side of the Katy Freeway. 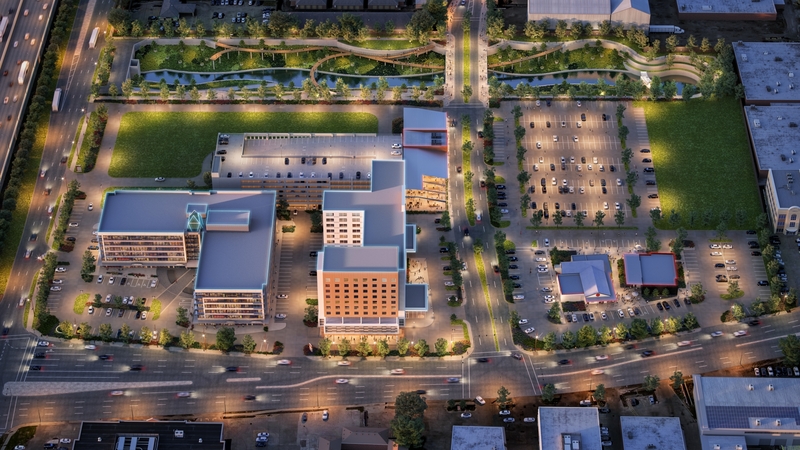 The jump to the north side of the freeway represents a major expansion of MetroNational’s 265-acre Memorial City development. New tenants on the 18-acre tract, located at the northwest corner of Gessner and the Katy Freeway, will include Torchy’s Tacos, Kirby Ice House and Johnny Carrabba’s Mia’s Table. Kirby Ice House, designed by Energy Architecture,is slated to break ground Summer 2019, with an anticipated opening Fall 2020. Heights Venture will serve as architect for both Mia’s Table and Torchy’s Tacos. Both will break ground Spring 2019 and are expected to open Spring 2020. “This master plan exemplifies the health of the West Houston corridor,” said Jason Johnson, President of MetroNational. “Our company began assembling this 18-acre tract in 2005 as part of our strategic master plan. This major expansion illustrates our continued commitment to developing and redeveloping the 265 acres that comprises Memorial City. MetroNational, which was founded in 1954, owns and manages more than 9.9 million square feet of commercial real estate properties primarily located in Greater Houston. MetroNational’s largest development is Memorial City located in West Houston.